On May 17, we moved from the Spanish Wells mooring field a short distance to an anchorage at Royal Island in order to make a quicker exit to start our trip back to the States. This is a nice anchorage, but doesn’t have good shore access to take Daisy. The sandy beach is private and the rest of the shore is steep and rocky. As you can see in the photo, Mark took Daisy to shore and they had to climb up to get on it. Daisy seemed a little spooked, so I guess she wondered why she wasn’t on a sandy beach. set the alarm for 0530 so Daisy could go ashore before we left on May 18. It was 0640 when we raised the anchor and headed out of the anchorage. 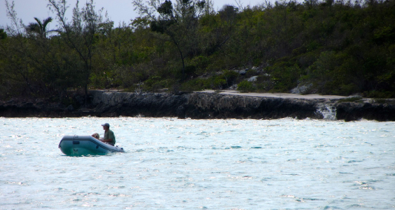 Many cruisers go from Royal Island to Nassau, but we decided to make the longer trip to Chubb Cay skipping Nassau. We were there by 1435. This is an upscale cay with a very expensive marina and large beautiful houses. They reminded us of homes on the ocean in Charleston. There were pretty beaches but all were marked private. In The Bahamas, all beaches are public up to the high water line, but we didn’t want to push it so Mark took Daisy to nearby Crab Cay. The beach wasn’t quite as nice, but it was sandy and there were a lot of shells. Apparently no one goes there. 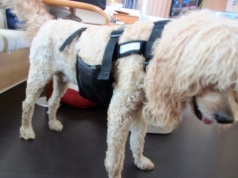 However, Daisy always gets her two or three walks a day thanks to Mark’s willingness to take her in any conditions. While the temperature was quite warm all winter and spring in The Bahamas, Daisy never seemed to be bothered by the heat. Of course, she was able to swim and cool off. As we sailed back toward Florida, she was panting. We got out her Chilly Dog Cool Pack, froze the blue ice (which is actually white) and inserted them in the pockets which are around her belly. She loves it and slept comfortably for the whole trip. However, she does seem a bit embarrassed in the photo. Then again, maybe she was anxious to stop posing and get into her position at the helm. On May 19, we had the anchor raised at 0607 and were on our way to Bimini. This was the longest leg of the trip and we arrived at 1718. 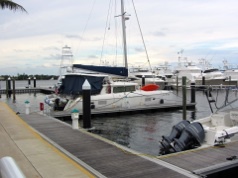 We checked into Bimini Sands Resort and Marina where we spent 17 days last January waiting for weather. We had shore power for the first time in almost five months. The first thing that went on was the air conditioner. It’s not that we missed it, but it was great to get the moisture out of the air. We love this marina. Old Port Cove is mostly filled with sportfishers and megayachts. There are only three sailboats in this large, almost full marina surrounded by high rise condos. Tiger Woods keeps his yacht here. This was our first stop after we left Stuart in December and our windlass broke as we dropped the anchor in the bay next to the marina. We came into a marina slip and ordered a new windlass. At the time they were renovating the buildings and now it is all done. We we checked in, we were given a gift bag which was a first for us. Among other things, we got two silver insulated mugs with the name of the marina printed on them. We can get free coffee from the marina store as often as we want when we bring in our mugs. When cruisers return to the States after being out of the country on a boat, they have to check in with Customs and Immigration. We had an interview with Immigration three years ago and received the Local Boaters Option (LBO). We also purchased a 2013 customs decal before we left Florida in January. 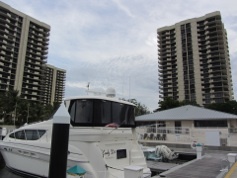 As soon as we entered Florida waters we called a phone number and gave the agent our LBO numbers and our decal number. The entire conversation took less than a minute and we were legally back in the country. Without having an LBO and the decal, cruisers have 24 hours after entering US waters to show up at a Customs and Immigration office. This usually involves taking a cab or renting a car. In Lake Worth the office is near the marinas, but still much more complicated than making a quick phone call. We called Mack Sails as soon as we arrived and couldn’t get an appointment to have the sails removed and the mast unstepped until Tuesday, May 28. So rather than stay here, we will go to our home port, Sunset Bay and return here next week. It will take us about six hours to get to Stuart, motoring on the ICW. We will go under ten bridges, many of them bascule bridges opening on a schedule or on demand. 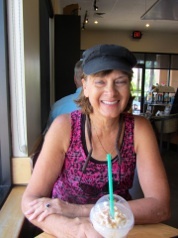 Today we rode our bikes the short distance on US 1 to West Marine, Publix Grocery and .......Starbucks!!! Do I look happy? We wandered up and down the aisles of Publix in awe. Well, maybe not awe, but we saw a lot of products we hadn’t seen for five months. Until you have shopped at stores in houses, you can’t fully realize how fortunate we are in this country to have so many choices and, in comparison, such low prices.